Vanilla Ice Cream Recipe – easy to make basic and eggless ice cream recipe. 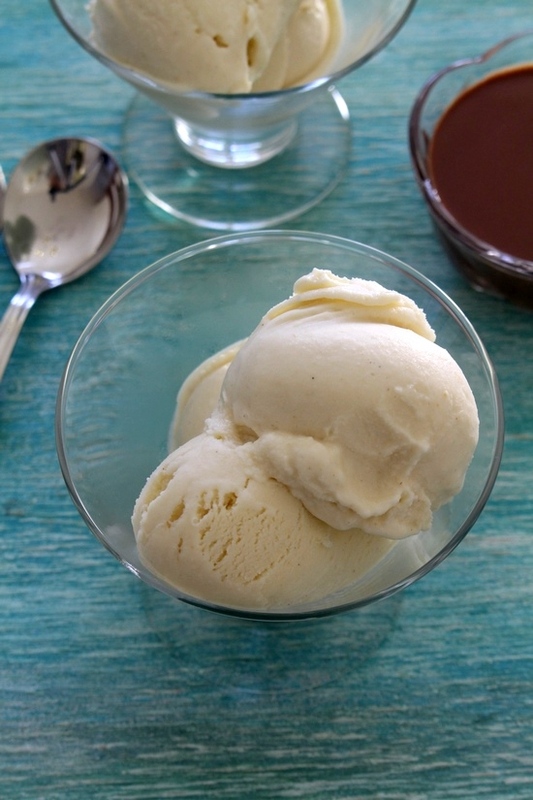 This homemade vanilla ice cream made without ice cream maker. Great, right? There are many brands of vanilla ice cream available in market. But the homemade is totally different in terms of flavor, taste and texture. As I said earlier, this is eggless vanilla ice cream recipe. Meaning this is not custard based ice cream where egg yolks are used. Rather this one is known as Philadelphia style ice cream. 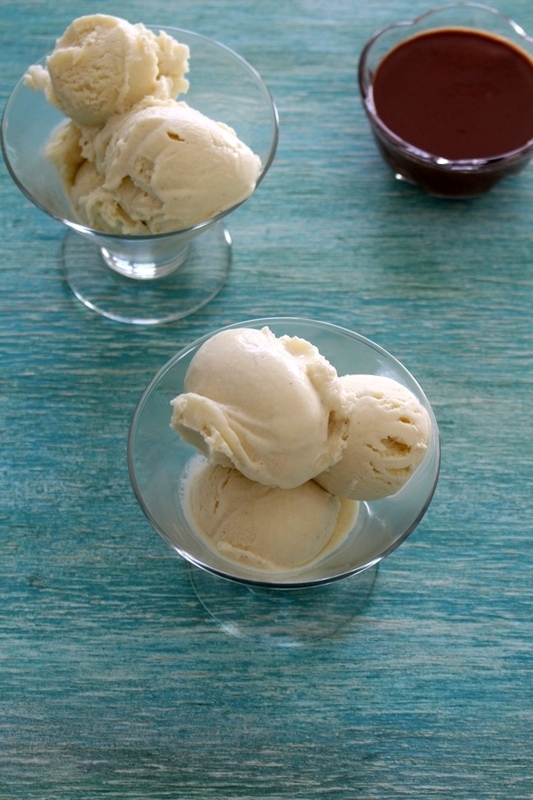 This basic vanilla ice cream is rich, creamy and smooth. Store bought ones are smooth and light but not rich or creamy unless you are having it at local ice cream parlor. Since this is rich ice cream, two scoops of it is more than enough per person. Even though it is made without ice cream maker, there are no ice crystals found in it. Keep in mind that this is made at home. We are not adding any stabilizers here which are always present in store-bought one. Because of the absence of stabilizers, this homemade vanilla ice cream will melt faster. 1) Take cornstarch in a small bowl. 2) Make smooth paste by adding 2-3 tablespoons of milk. Keep it aside. 3) Take milk powder in another small bowl. 4) Add about ⅓ cup of milk and make smooth paste. 5) Take remaining milk in a wide and thick bottom pan. Turn the heat on medium. 6) Bring the milk to a boil. Keep an eye on it, because milk has tendency to flow over. Do stir occasionally and make sure that it is not sticking to the bottom of the pan. 7) Once it starts simmering, add sugar and mix well. 8) Let it simmer till it thickens slightly (for about 10-12 minutes). Do scrap the side and bottom of the pan using spatula every now and then. We don’t want the milk to burn and stick to the pan. 9) Now add prepared cornstarch mixture and stir well. 10) Also add milk powder paste and mix. 11) Keep stirring and cooking for 7-8 minutes or till it becomes thick. 12) The mixture should coat the back of spoon or spatula. At that point, turn off the stove. 13) Remove the thick, sweetened mix mixture into a bowl and let it cool completely. 14) As it cools it will thicken more. If it looks lumpy after cooling down, you can use wire whisk or hand mixer or blender to break the lumps and make smooth batter. 17) Now using hand mixer, beat the mixture. 18) Beat it for about 4-5 minutes or till it gets light and airy. 19) Now add vanilla paste or vanilla extract (whatever you are using). NOTE: if using vanilla bean, then you can scrape the seeds and add to the milk while it was simmering. You can also throw the pod as well into simmering milk and remove it later on. 20) Stir well to combine. 21) Pour the mixture into shallow container. Here I am using loaf pan. 22) Cover the surface using plastic wrap and make sure that plastic is touching the ice cream mixture. This ways ice crystals will no form on top. Then cover with lid. 23) Pop in the freeze and let it set for 3-4 hours. Within this time, it should be just set still soft. 24) Remove the container from the freezer, make big slices or cubes. Add it to the blender. 25) Blend it till the mixture gets smooth and ice crystals are broken. 26) Pour the mixture back into the container. 27) Again cover with plastic and it should be touching to the surface. 28) Keep in the freezer till it is completely set. At the time of serving, remove the container from the freezer and let it stand for 2 minutes. Then scoop the vanilla ice cream and serve into individual bowl. Serving suggestion: Serve a scoop or two as a dessert after meal. Or enjoy it anytime of the day. You can drizzle any fruit sauce or chocolate sauce, butterscotch sauce or magic hard shell on top. Vanilla ice cream can be used in making falooda or milkshake like vanilla milkshake, cashew-fig milkshake. Have a scoop of it with warm brownie or pie. I recommend to use whole milk or full fat milk. I have tried with 2% milk and it gave me good results but still I prefer the one made from full fat milk. Cornstarch slurry will help to thicken the milk faster. Here I have used full fat milk powder. This makes the ice cream more creamier. You can use non fat milk powder too. Here I have used vanilla paste which gave me more intense vanilla flavor. Yes you can use PURE vanilla extract instead. I said ‘pure’ not imitation one which may leave the bitter aftertaste. If you can use vanilla bean, then it is best (instructions included above). easy to make basic and eggless ice cream recipe. 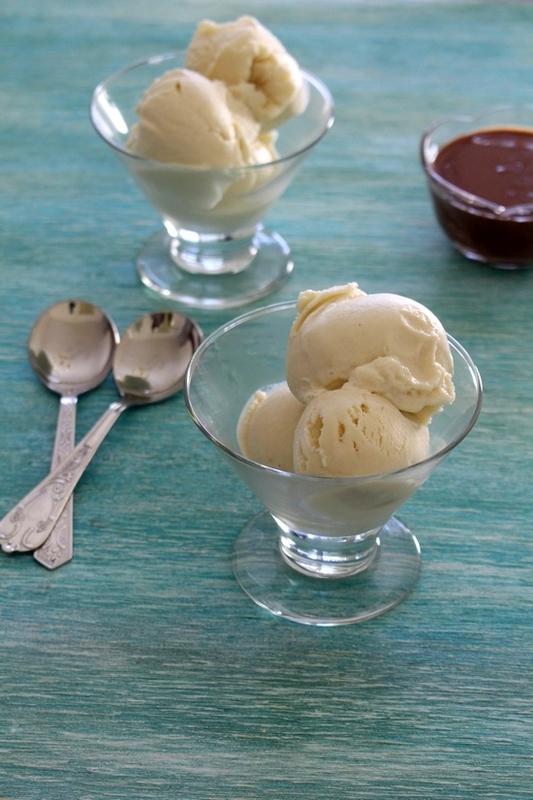 This homemade vanilla ice cream made without ice cream maker. Take cornstarch in a small bowl. Make smooth paste by adding 2-3 tablespoons of milk. Keep it aside. Take milk powder in another small bowl. Add about 1/3 cup of milk and make smooth paste. Take remaining milk in a wide and thick bottom pan. Turn the heat on medium. Bring the milk to a boil. Do stir occasionally. Once it starts simmering, add sugar and mix well. Let it simmer till it thickens slightly (for about 10-12 minutes). Do scrap the side and bottom of the pan using spatula every now and then. Now add prepared cornstarch mixture and stir well. Also add milk powder paste and mix. Keep stirring and cooking for 7-8 minutes or till it becomes thick. The mixture should coat the back of spoon or spatula. At that point, turn off the stove. Remove the thick, sweetened mix mixture into a bowl and let it cool completely. As it cools it will thicken more. If it looks lumpy after cooling down, you can use wire whisk or hand mixer or blender to break the lumps and make smooth mixture. Add heavy cream. And mix well. Now using hand mixer, beat the mixture. Beat it for about 4-5 minutes or till it gets light and airy. Now add vanilla paste or vanilla extract (whatever you are using). Stir well to combine. Pour the mixture into shallow container. Cover the surface using plastic wrap and make sure that plastic is touching the ice cream mixture. Pop in the freeze and let it set for 3-4 hours. Within this time, it should be just set still soft. Remove the container from the freezer, make big slices or cubes. Add it to the blender. Blend it till the mixture gets smooth and ice crystals are broken. Pour the mixture back into the container. Again cover with plastic and it should be touching to the surface. Keep in the freezer till it is completely set. Any replacement for milk powder? I want to make it for my little one, but don’t want to use store bought milk powders ( which I am sure have preservatives). Also can I use hand blender instead of hand mixer for mixing purpose? I don’t have latter. you can skip milk powder. It is added for extra creaminess and richness. You cannot use hand blender. but instead use wire whisk and whip it by hand. I have read comment about coffee ice cream. And i also saw your mango ice cream recipe. But, as vanilla extract comes costly(basically i use it for baking); I don’t like idea of using it on regular basis in ice-creams. I made this ice-cream and it tastes wonderful. i just loved it. But i want to make homemade ice-creams more frequently and i was wondering if i can omit vanilla completely? Like here you made base and added vanilla lastly. So can i replace vanilla with some other flavor? Like fruits or choco-chips or nuts? will it work? what are views? yes this is basic ice cream recipe. vanilla extract is added here just for flavoring. You can skip that or replace with any other flavor (e.g. add saffron + chopped pista = kesar pista ice cream). You can add any other nuts (almonds, cashews, hazelnut with cocoa powder), raisins, chopped or pureed figs, chocolate chips, cocoa powder, any fruit puree. Only thing needs to adjust is sugar. if using sweet fruit puree then reduce the sugar slightly. Adding cocoa powder, you may need to add little more sugar. Make it as per your liking. Good that it is helpful. Hi Karan, nice recipe!! Can I add cocoa powder or coffee to make chocolate or coffee flavored ice cream ?? Yes you can. But you need to adjust (increase) the sugar quantity since cocoa powder and coffee both are unsweetened.